How long did it take to learn counterinsurgency in Iraq? The Small Wars Journal blog post COIN Toss is better reading for the comments than the TNR article it links. Gian Gentile questions the assertion that we didn’t learn counterinsurgency in Iraq until 2004 (2005, 2006 or whenever)? Questioning conventional wisdom again, he is. Because your book, David, conforms to the Coin template. It accepts the notion without evidentiary proof that the American Army did not start learning and adapting until a certain point, then after that it did. You say 2005, then I ask again why 2005 and not 2003? What proof do you have? Don Wright’s and Tim Reese’s book, “On Point II,” argues the opposite that the majority of Army combat units were learning and adapting and adjusting to Coin very quickly, almost as soon as they hit the ground in Spring and Summer of 2003. I heard a very senior American Army General who commanded a Division in Iraq in 2003 (not General Petraeus by the way) state basically the same thing that his Division learned and adapted quite well to the various situations that confronted them on the ground. Your book reads almost verbatim like the Nagl/Krepinevich critique of the American Army in Vietnam in which the American Army did not learn and adapt in that war. Moonshine. It did, in many different ways. So too did the American Army start its learning and adapting in Iraq in 2003. And do you want to know why it was able to do that learning and adapting so quickly, David? Because it was an army trained and optimized for combined arms warfare. It is books like yours that elevate the principle of learning and adapting toward better population centric coin above the fundamental necessity to do combined arms. In a sense you and many of the other Coin experts are putting the cart before the horse. The ability to do combined arms at all organizational levels gives an army in whatever situation it is thrust into the subsequent ability to seize and maintain the initiative; it can act. And if it acts first in response to a hostile enemy force or complex conditions through the initiative it can learn and adapt. My worry is that all of this talk of Coin and learning Coin and learning and adapting, yada, yada, yada, has taken our eyes off the absolute necessity of combined arms competencies and replaced it with an artificial construct of learning and adapting toward better population centric Counterinsurgency. As I have argued before, the rules of this construct, however, do not allow a unit to learn and adapt its way out of doing Coin. This box that we are in continues to push us down the Coin path toward significant organizational changes, and it keeps us locked in a world of tactics and operations, unable to see and do strategy. Strategy in war of course is more important than tactics and operations. It was a failure at strategy that caused us to lose the Vietnam War, not because the American Army didn’t learn and adapt toward doing better Coin tactics and operations. To be sure, the importance of the “awakening” in Anbar must be one of the elements of understanding that campaign, but the popular myth has grown up around Western Iraq that makes it all about drinking chai, siding with the tribes, going softer in our approach, and finally listening to them as they communicated to us. And the leader of this revolution in counterinsurgency warfare was none other than General Petraeus. We were losing until he appeared on the scene, and when he did things turned around. We Americans love our generals, but this explanation has taken on mythical proportions, and is itself full of myths, gross exaggerations and outright falsehoods. While Captain Travis Patriquin was courting Sheik Abdul Sattar Abu Risha, elements of the U.S. forces were targeting his smuggling lines and killing his tribal members to shut down his sources of income. The tribal awakening had a context, and that was the use of force. As the pundits talk about the tribes, the Marines talk about kinetics. Furthermore, the tribal awakening was specific to Ramadi. The beginnings of cooperation between U.S. forces and local elements came in al Qaim between Marines and a strong man police chief named Abu Ahmed. In Haditha it necessitated sand berms around the city to isolate it from insurgents coming across the border from Syria, along with a strong man police chief named Colonel Faruq. In Fallujah in 2007 it required heavy kinetics, followed on by census taking, gated communities, biometrics and heavy policing. Even late in 2007 Ramadi was described by Marine Lieutenant Colonel Mike Silverman as like Stalingrad. Examples abound, and as late as 2008, artillery elements fired as many as 11,000 155 mm (M105) rounds in Baquba, Iraq in response to insurgent mortar activity. Whatever else General Petraeus did for Operation Iraqi Freedom, the U.S. Marine campaign for Anbar was underway, prosecuted before the advent of Petraeus, and continued the same way it was begun. The Marines lost more than 1000 men in combat, and this heavy toll was a necessary investment regardless of drinking chai with the locals. Regular readers know that I am not part of the COIN bandwagon. We didn’t learn counterinsurgency TTPs in Iraq from FM 3-24 or the advent of the right generals. The campaign in Anbar conducted by the U.S. Marines started, was conducted, and ended like it started and was conducted. There was no turning to the right or to the left. It was relentless, full-orbed targeting of the insurgency and policing of the population at its root. It had phases because counterinsurgency has them, not because of a new general. It may be that we in fact did learn strategically in greater Iraq, but not in the way the COIN proponents claim. When the Baghdad Museum was under assault for its wares and possessions and the public saw this, most heads of household likely thought, “Uh huh, check the box, I get it. It’s clear now. They either don’t have what it takes or refuse to protect my belongings. My entire net worth will be spent on that AK-47 after all.” And young Omar saw exactly what paid well. Overthrowing a government while our Soldiers and Marines had to follow on in post-Saddam Iraq with rules that resemble the SCOTUS decision in Tennessee v. Garner was a mistake of mammoth proportions, and lead to countless deaths of both U.S. forces and Iraqi civilians. Paradoxically, our aim and desire for civility lead in part to the pain they and we experienced. Leaving Sadr alive (who was in the actual possession of the 3/2 Marines) because the British and Sistani wanted us to was a mistake. Withdrawing from Fallujah during the first assault (al Fajr) was a mistake, and so on the process goes. But these are strategic failures – failures of command, and failures that if anything else too closely followed COIN / nation building dogma. No, drinking chai with the locals didn’t win Iraq. We were successful when we allowed our fighting men to do what was necessary to win the peace. The Taliban has become a much more potent adversary in Afghanistan by improving its own tactics and finding gaps in the US military playbook, according to senior American military officials who acknowledged that the enemy’s resurgence this year has taken them by surprise. US rules of engagement restricting the use of air power and aggressive action against civilians have also opened new space for the insurgents, officials said. A very recent article in the Washington Post says that the enemy in Afghanistan has improved its tactical fighting abilities when confronting American forces there. The article stated that the enemy has figured out “gaps” in the current American tactical and operational approach of population centric counterinsurgency. And the article added the tactical improvement on the part of the enemy in Afghanistan, according to “American military officials,” has taken us by “surprise.” This means in effect that the enemy has the initiative. Afghanistan is war, right? In war there has to be fighting or the threat of fighting for it to be war, right? If there is no fighting or threat of fighting then it cannot be war, right? The answer to this tactical problem in Afghanistan provided by the Counterinsurgency Experts is better population centric Coin tactics and operations; just try harder at building schools, roads, local security forces, establishing government legitimacy, and population security through dispersion of forces to protect them. Once we get better at these processes and try just a bit harder, with a just a few more troops, then voila (just like we think happened in Iraq) victory is achieved, triumph is at hand. But where in this formulation of scientific processes are the enemy and the killing of them? Perhaps the way ahead in Afghanistan, at least the immediate way ahead to stabilize the situation is to not focus on hearts and minds but in killing the enemy. This is not so radical of an idea, mind you. Earlier this year two infantry lieutenants and one of their sergeants, fresh from hard combat experience in Afghanistan, made the argument that the American Army was losing its ability in Afghanistan to conduct basic infantry combined arms warfare. Their solution was not better population centric counterinsurgency tactics and processes but improving infantry platoons and companies ability to close with and kill the enemy through fire and maneuver. What they were calling for was a reinvention of the American Army’s approach in Afghanistan in order to regain the initiative. And in war, whether it is counterinsurgency war, conventional war, hybrid war, whatever, the INITIATIVE is everything. In Afghanistan we have lost the initiative because population centric counterinsurgency is basically a symmetrical, reactive tactical and operational measure. 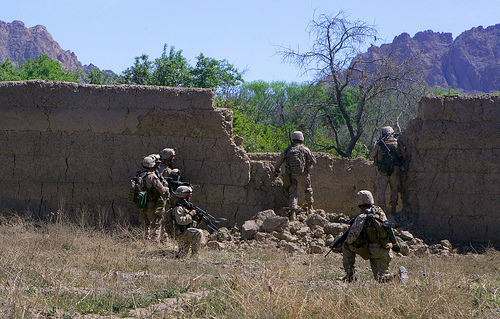 History shows that focusing on killing the enemy works in a counterinsurgency campaign. The British in Malaya for example (what follows is radically contrary to conventional knowledge about Malaya that has been built by a bevy of counterinsurgency experts and zealots since the end of American involvement in the Vietnam War but is supported by current historical scholarship) broke the back of the insurgency there by brute military force from 1951 to 1952, and not as is so commonly believed through the hearts and minds campaign conducted by General Templer from 1952 to 1954. Generally I think that articles which rely on the ideas of other bloggers is to be avoided. Occasionally however, it is appropriate to respond to critics. One strength of blogging is the ability to link, criticize, interact, and respond. I accept that although I don’t want it to dominate my prose. Now for Gulliver at Ink Spots. People will use just about anything as evidence for things they already believe. Case in point: Herschel Smith thinks that the presence of women in Soviet combat formations is one of the top five most important reasons for their failure in Afghanistan. This comes in the SWJ comment thread about an article on “Sri Lanka’s disconcerting COIN strategy,” as part of a post in which Smith dismisses Soviet “ruthlessness” as one of the primary reasons for defeat in the Afghan war. So in short, girls in the infantry were more damaging to the Russian war effort than bad counterinsurgency tactics. “There is the thing of testosterone, and it’s different because God made it that way.” Ok? Ok. Glad we cleared that one up. Let’s think carefully about both my comment and Gulliver’s reaction to it. Both say something about the commenters and their thought boundaries. The comment was left at the Small Wars Journal blog in response to an article by Major Niel Smith. If I may be allowed to summarize the thesis, he posits that the more violent and less population centric counterinsurgency model has its supporters. He specifically mentions Ralph Peters and Colonel Gian Gentile; I’m not sure sure about Ralph Peters, but I would comment that the inclusion of Colonel Gentile in this category is true to some extent, but somewhat inappropriate given the nuance included in Gentile’s model and also given the use made of this inclusion (for one of the best discussions of Gentile’s position, see The Imperative for an American General Purpose Army That Can Fight, Foreign Policy Research Institute). His (Niel Smith’s) discussion ranges into the brutality of less population centric counterinsurgency, and in this he should have (in my opinion) focused more on Edward Luttwak. But getting back to the main point, Niel goes on to grant the assumption that some of the evidence is compelling in favor of this view, but that there is even more compelling contrary evidence – defeater evidence – for the success rate of counterinsurgency focused on heavier combat tactics. At this point he uses several examples, one of which is the Russian campaign in Afghanistan. So Niel has written a fairly open minded article positing that there is evidence to support what I will call the Luttwak position, while more compelling defeater evidence. He then invites critique. In my critique I didn’t weigh in on the overall thesis, but did essentially state that the Russian campaign was a poor example to support the thesis. I opined that there were other more important reasons that the Russians lost the campaign. Enter Gulliver. He thinks that I have listed my top five reasons that the Russian campaign failed. Why Gulliver thinks that I have listed my top five reasons is not known. Gulliver would have to answer that question himself. If I had been asked to list my top reasons that the Russian campaign failed, I probably would lead with focus on the population centers and relegation of the countryside to the Taliban to recruit, train and raise support. In second place wouldn’t be U.S. help and assistance, although many would place this one in first or second. My second reason (challenging for top spot) would be the existence of the Russian made RPG, plentiful to the Taliban for reasons that included U.S. help. The Russian RPG was the first EFP (explosively formed projectile) used en mass on the battle field. But no one asked me to enumerate my top five reasons the campaign failed. I merely included a list of things that initially came to mind. Let’s deal with women in combat now. Gulliver’s response drips with sarcasm even after his incorrect assumptions concerning my list of reasons that the Russians lost. But it remains undisputed that there were women in combat billets in the Russian campaign, and it remains undisputed that there were a large number of lower extremity injuries and that this led to a large number of ineffective units. Marine in Helmand suffering under a heavy combat load, way more than 100 pounds. But there is more to discuss on this issue. 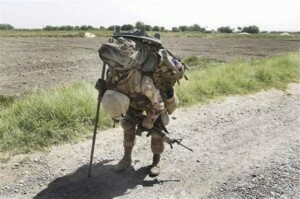 As regular readers know, we have followed the dismounted campaign by the U.S. Marines in the Helmand Province. CBS reporter Lara Logan has seen the Marines in Helmand without an ounce of fat on their bodies, and she has even expressed concern over their health. When my son deployed to Fallujah he was so slim and muscular that I wondered how he would lose any weight whatsoever, as there was no weight to lose. The only way he lost 20 or 30 pounds was the same way the Marines in Helmand do it. The body turns on itself and begins eating muscle for energy. I am a weight lifter and I know how to avoid this, i.e., I know when to stop my workout because I am no longer helping my body. It’s actually dangerous, although Ms. Logan doesn’t know how to express it. The body hurts itself when it begins using muscle and internal organs for energy. Here is a test question. We have discussed the Marines carrying 120 pounds on their back in 120 F heat in Helmand, patrolling all day and even conducting squad rushes with this weight. Now for the question for the readers. How many of you – raise your hands now – believe that women could carry 120 pounds in 120 F heat all day in Helmand and then conduct squad rushes? You can answer in the comments – it’s okay. But if you answer yes, you are also required to tell us what kind of dope you’ve been smoking. You see, we all know what the honest answer to this question is, even if Gulliver doesn’t admit that he does. Now let’s close with a little examination of what the Democrats think about special forces, special operations forces, and women in combat billets. I support women in the military, and one example of such a role would be the use of female Marines to interact with Afghan women after terrain has been seized. But the Democrats in Congress ( hereafter Dems) wanted something different for the Army. Hence, women occupy combat billets in the Army. The Dems want their social experiments and projects, but even they know that there has to be a boundary for this. Michael Fumento has a good article on the Dems’ love of SF and SOF and their promise to expand the SF. I have weighed in on the cult of Special Forces, so I won’t reiterate my issues with the Dems’ proposal or Michael Fumento’s prose here. The point is that SF are deployed all over the globe. They are involved in black operations that are never seen, never heard of, and are not subject to the Dems’ social experiments. The Dems know this and they want it that way. Women are not allowed in combat billets, not in the Special Forces, not in the Special Operations Forces, and not in Marine infantry. The Dems want their programs, but they also want to know that they can call on infantry to do the job of infantry, so they restrict their own programs to known boundaries. I challenged those boundaries and believe that they should not allow women in Army infantry. The Dems include women in Army infantry. But they stop there. Not the Marines, and not Army SF. There you have it. They are at the best simply not forthcoming, and at the worst, disingenuous liars. The truth gets spoken in quiet circles when no one but the power brokers are listening. The public hears what the power brokers want them to hear. One piece of that tripe is that there is no difference between men and women in the military. They know better, but don’t want you to know that they know. Now back to Gulliver … if Gulliver has managed to hang on and pay attention this long. Is it I who has allowed his bias (presuppositions) to dictate the outcome, or Gulliver? Note again his comments above. Gulliver is simply indignant that I have “dismissed” Soviet ruthlessness as the reason for their failure in the campaign. But isn’t he begging the question? Has he not even allowed the Niel Smith’s assumptions to dictate the course of the debate? Niel has allowed that there is evidence that supports Luttwak’s thesis, but believes that there is stronger defeater evidence. Gulliver doesn’t engage in the debate. He simply assumes that the Soviets lost due to the reasons he outlines, and then proceeds from there. Who then is the one who uses just about anything as evidence for things he already believes? The reader can judge for himself. In the mean time, I have given you Luttwak, Gentile, Niel Smith, women in combat billets, heavy combat loads, squad rushes, the Small Wars Journal blog, SF and SOF, black operations and the Dems in Congress to think about. If I ever give you worthless tripe like you read at Ink Spots, you should savage me in the comments. General McChrystal recently released counterinsurgency guidance for the ISAF. From the very first executive summary statement, the mission(s) of protecting the people and destroying the enemy are set in juxtaposition with each other, as if contradictory or somehow mutually exclusive. We have dealt with this before in Center of Gravity Versus Lines of Effort in COIN, so this issue will not be reiterated except to say that no one – no one, not the so-called COIN experts at CNAS, not military historians, no one – has demonstrated that for success in counterinsurgency we must focus away from killing the enemy. Iraq was done the opposite way, with heavy kinetics and intelligence driven raids a huge part of the campaign from 2006 through 2008. There is much with which to agree in the document, including what the Marines are doing in the Helmand Province to exemplify the guidance contained in this document – heavy interaction with the population. Furthermore, it is obviously necessary to protect the population from killers and get the population involved in the fight against the insurgency. But there are so many things with which to disagree it’s difficult to know where to begin. Page 2: ” … an insurgency cannot be defeated by attrition; its supply of fighters, and even leadership, is effectively endless.” Well, this simply isn’t true. Turning to the most recent counterinsurgency campaign in our history, Operation Iraqi Freedom, I know something about how the Marines approached the campaign in the Anbar Province. To claim that the U.S. Marines bifurcated and set in opposition the notions of protecting the population and killing the enemy is worse than just dense. It’s dishonest. Tens of thousands of insurgents were killed, Anbar was pacified before the balance of Iraq, and the supply of insurgents wasn’t endless. I just don’t know how to be clearer. This claim is simply false. Now just to make sure that we are clear on this, jirgas are good. Community projects are good. But this statement goes so far down the path of the Western-trained PhD sociology student that it’s unclear why we aren’t reading that “flowers are beautiful, butterflies are too, and I love you!” (Colonel Gian Gentile also warns against the notion of “weaponizing” cultural knowledge because it is an illusion). Now. Note the claim. After outlining various things that could be considered offensive operations, it is stated that missions designed to disrupt militants is not offensive. This is so gobsmackingly outlandish and juvenile that it really casts serious doubt as to whether we can grant any legitimacy whatsoever to this document. After having to perform squad rushes against Taliban positions in Helmand recently, it’s doubtful that the Marines will have any use for this guidance. This document seems to be the kind of thing that staff officers discuss with field grade officers who discretely roll their eyes, while the junior officers wouldn’t be caught telling their reports that their recent squad rush directly into Taliban fire wasn’t really an offensive operation. This sounds more like a football coach pep talk than a General advising his troops. It will likely have little traction with U.S. forces who have watched the ANA engage in drug abuse, smoke hashish before patrols, collude with Taliban fighters to kill U.S. troops, themselves claim that they cannot hold Helmand without Marines and fear being killed if they even go out into the streets, be relatively ineffective against Taliban fighters, sleep on their watch, and claim to be on vacation in the Helmand Province. The incoherence of the document and perhaps mildly or moderately insulting and preachy manner will limit its usefulness in the field and even in the classroom. Fortunately, while this document is being sent to leaders in Afghanistan, General McChrystal is quietly preparing to give the administration options, all of which include more troops (although not as many as we had recommended). The general is leaning toward three major options — the “high risk strategy” is to add only 15,000 troops to the 68,000 that will be on the ground by the end of this year — as in, the highest risk of failure. The “medium risk strategy” is to add 25,000 troops, and the “low risk strategy” is 45,000, according to a senior defense adviser helping craft the plan. Also fortunately, the enlisted Marines in Helmand won’t be reading this document. They don’t have time, as they will be doing what the author of this document has not discussed. They will be engaging in full orbed, comprehensive counterinsurgency in their area of operation, from jirgas to squad rushes. Let’s hope that the balance of the forces will be doing the same thing in spite of the guidance. Friend of The Captain’s Journal Colonel Gian Gentile is well known for his arguments that the traditional warfighting skills should not be allowed to atrophy. He strikes back at those who simplistically claim that this means turning the clock back a quarter century or more. Arguing for rebuilding the Army’s capacity for conventional operations does not mean taking the Service back to 1986 in order to recreate the old Soviet Union so we can prepare to fight World War II all over again in the Fulda Gap. Such accusations have become the standard—and wrongheaded—critique that purveyors of counterinsurgency dogma like to throw at anybody who argues for a renewed focus on conventional capabilities. The Army does need to transform from its antiquated Cold War structure toward one that can deal with the security challenges of the new millennium and one focused primarily on fighting as its core competency (italics mine). U.S. Marine Corps Commandant Conway apparently agrees, at least as it pertains to skills he sees being at risk to atrophy. The Marine Corps hopes to give Marines 14 months at home after deployments by mid-2010, Corps Commandant Gen. James Conway said Thursday. Currently, Marines spend seven months deployed and seven months home, but that could change now that the Corps has grown to 202,000 ahead of schedule, and with almost all Marines expected to leave Iraq next spring, Conway said. Marines will also use that extra time to train for amphibious landings and to fight conventional wars, two types of skill-sets that have deteriorated as the Corps has focused on counterinsurgency, he said. The importance of Marines getting back to their traditional warfighting skills is underscored by current tensions on the Korean peninsula, he said. If a conflict broke out, Marines would likely be called upon to launch amphibious operations, he said. Defense Secretary Robert Gates implied in April that amphibious landings might be a thing of the past, noting that the Corps’ last major landing was in 1950. Asked about Gates’ comments later that month, Conway said the Corps had launched amphibious operations since then, most notably when Marines helped to evacuate U.S. citizens from Lebanon in 2006. Conway quickly added Thursday that the Corps would be able to do the job eventually. “But I’m simply arguing we can do it better when we’re trained to it, and that’s the value of this 1:2 deployment to dwell: to give us the opportunity to give those young Marines more time with the families and more time to, again, relax at home, but also to get on these training fields and get back some of these core competencies that have withered over time,” he said. It’s very difficult to imagine a near-peer or even a nuclear-armed state (whether near-peer or not) settling for massive human casualties in a conventional war without invoking the nuclear option (which is not quite the same thing as saying that it’s hard to imagine a conventional campaign in the future). Contrary to what many think, the best use for nuclear weapons is not using them – it is in creating a situation in which they don’t have to be used. There is also no question that while counterinsurgency involves the application of soft power, it also includes quite conventional warfighting skills at times (as these two videos show). We have discussed the Taliban tactic of massing troops against smaller units of U.S. forces, up to and including half-Battalion size engagements. The lessons learned from one such engagement with a Marine Force Recon company was to remember the tactics taught in School of Infantry, because they will be used in such fights. Involvement in counterinsurgency campaigns has brought U.S. forces to the point of being the most combat experienced fighters on earth, contrary to the example of the appalling performance turned in by the Russian troops against the Georgian Army (an Army, by the way, which had come back from Iraq with recent experience). It is also very difficult to imagine that the Marine Corps will ever launch another large scale amphibious assault involving high numbers of casualties. Other ways will be found – and should be found – leading us to recommend replacement of the EFV and the notion of sea-based assault with more air power and delivery aboard Amphibious Assault Docks. Either way, talk of amphibious assaults clouds the main point, and it is one on which both Colonel Gentile and the Commandant have settled. We must not let our warfighting skills atrophy. With the Commandant, The Captain’s Journal also believes very strongly in the concept of the Air Ground Task Force, as well as teaching all Marines to perform squad rushes and other conventional tactics as well as the room clearing and constabulary operations more focused on counterinsurgency. Quite obviously, if the Marines are not performing these field exercies and maneuvers, then it’s high time to get back to them. This is equally true for the Army. One need not posit the near-peer conflict in order to see the usefulness of warfighting skills if these very tactics are being used in the counterinsurgency campaigns in which we are now engaged.